Rumour has it that John Ruskin was not enamored by the sight of pubic hair on a woman. Taking this infamous and controversial story as a playful starting point, Art Macabre and Two Temple Place present a theatrical life drawing salon that will celebrate and explore body hair and ‘feminine’ beauty standards. Sketch up close and carefully observe women’s bodies that challenge traditional beauty ideals and aesthetics in art. Apply the drawing techniques taught by Ruskin to carefully observe and render from life our models’ body hair and perfectly-imperfect body. Plus sketch items from the exhibition ‘The Power of Seeing’ and enjoy seeing the artwork with a glass of wine. Art Macabre are one of the UK’s leading purveyors of theatrical life drawing events. 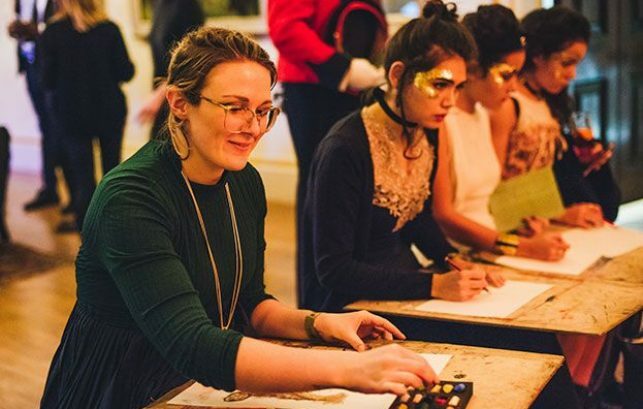 Since 2009, Art Macabre have allowed thousands of people to (re)discover the joy of drawing, injecting a lethal dose of imagination and curiosity into themed events held at spaces including festival fields, top galleries and museum Lates, cemeteries and heritage spaces. With residencies including Tower of London, RA, Tate Modern and English National Opera. Drawing materials and A3 paper provided, thanks to sponsors GreatArt.